A lot of glitz and glamour was on display at the 53rd annual Grammy Awards in Los Angeles on Sunday night. While Lady Gaga's dramatic appearance was the cynosure of all eyes, there were many like Rihanna, who managed to stand out from the crowd. The singer arrived in a provocative white outfit designed by Jean Paul Gaultier, which left nothing to the imagination. Not to be outdone, singer Ciara displays endless toned legs in this frothy concoction. Kim Kardashian may not be a singer or an actress, but this reality TV star sure knows how to work the red carpet. New American Idol judge Jennifer Lopez and mom of two keeps it short and sparkly in this Emilio Pucci long-sleeve mini dress. As for actress Nicole Kidman, she chose a figure hugging tiered gown to wow the crowd. Newly single Eva Longoria revealed her playful side in a sleeveless ruffled black top paired with a full white micro-mini skirt, designed by Saudi designer Ashi. Lea Michele from the television show Glee looked glamorous and sophisticated in black, unlike her on-screen teen avatar Rachel. Often criticised for red carpet appearances, Miley Cyrus' latest outing sees her in Roberto Cavalli snakeskin number. Katy Perry's Giorgio Armani gown with a dramatic cascading train and angel wings is more fitting for a church wedding than the red carpet. She was accompanied by her grandmother, as well as her husband Russell Brand. Sticking to the white theme is teen heartthrob Justin Bieber. The only glaring note is the white sneakers! Heidi Klum looked every inch the supermodel she is in this gold sheath. We almost didn't recognise Jennifer Hudson in her slim avatar. The former American Idol finalist recently went public about the secret behind her weight loss. Another star who seems to have shrunk is country singer LeAnn Rimes. Teenager Selena Gomez looks all grown up in this elegant gold metallic J Mendel gown. A visibly pregnant Selma Blair stuck to basic black. Cleary, Cyndi Lauper believes in her classic song 'Girls just wanna have fun'. The singer looks ready to party. Jennifer Hudson is not the only one to wow us with her slimmer avatar. Kelly Osbourne's transformation leaves us tongue tied as well. 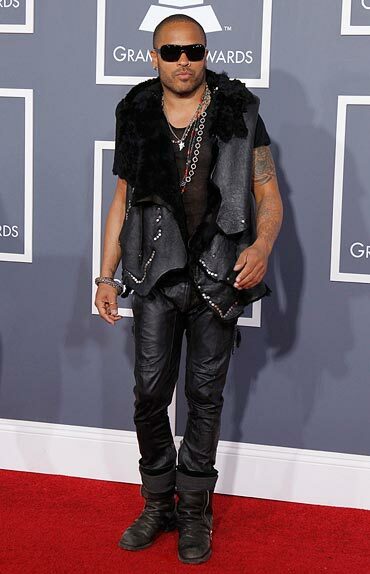 Another star we almost missed was singer Lenny Kravitz who looks unrecognizable without his famous locks.